So you’re dealing with missing teeth and have no idea what to do. Missing teeth can be a real pain in the mouth and can cause all sorts of confidence problems as soon as you open your mouth to smile, talk, yawn, sneeze or do whatever else. Your teeth are on display every time you do any of these things. Having a beautiful smile isn’t hard to accomplish, it just takes a visit to our office in Collierville, TN. Dr. Joshua Holcomb and his expert team are here to assist in getting you the smile of your dreams. 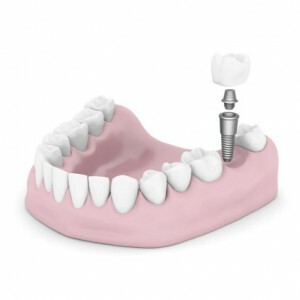 If missing teeth are holding you back from enjoying a smile that can turn heads in all the right ways, dental implants may be just what the doctor ordered…literally! Missing teeth are bad. There’s no two ways around it. Not only are they a pain to deal with when it comes to having a good looking appearance, but those open spaces can become breeding grounds for bacteria. You don’t want bacteria breeding grounds; they can lead to all sorts of problems. Did you know that infections can lead to overall-health risks, including death? We don’t want to scare you, we just want to let you know how serious any type of bacterial infection can be on your well-being. Did we mention dental implants take care of this problem? Dental implants can be the difference between having a healthy mouth and an unhealthy mouth. They not only fill in the space missing teeth leave behind, but they thwart bacteria’s journey to these prime areas. The procedure is quite comfortable, too. Dr. Holcomb uses a gentle hand and professional experience to place dental implants. Endurance – These babies aren’t temporary fixes; oh no. They are meant with the long-haul in mind, ergo permanent. Once they’re placed, you won’t have to worry about anything more than slight adjustments, should you need them. Toughness – These puppies are very strong. So strong, in fact, that in some cases they could put your regular teeth’s strength to shame. They are the Arnold Schwarzenegger replacements your mouth could use. As you can see, dental implants don’t mess around. If you want a permanent fix for missing teeth, this is the procedure you want. No more unsightly spaces or discomfort. It’s time to take advantage of this fantastic service. Relief is within sight, all you have to do is make an appointment at our Collierville, TN office. We’re happy to serve residents in the neighboring cities of Rossiville, Germantown, Cayce, Handy Corner, Fisherville and beyond.